The theatre is located at 118 Great Hampton Street, B18 6AD, next to Tesco Express and opposite The Church Inn and TSB bank. The Blue Orange Theatre is a thriving independent theatre situated in Birmingham’s Jewellery Quarter. Having finished an extensive refurbishment, we opened our doors in 2011. A 100 seat theatre space with raked comfortable seating. A rehearsal studio, approximately 10m x 8m. 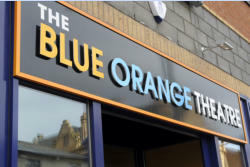 The Blue Orange Theatre is owned and operated by Blue Orange Arts Limited, a registered charity (No. 1145871). Blue Orange Arts Ltd is a multi-faceted arts organisation dedicated to providing high quality social projects to the local community, Birmingham and the West Midlands. For more information click here. The Blue Orange Theatre wants to engage as many people as possible with its productions, social projects, courses and workshops. We don’t charge booking or transaction fees and we keep our prices as reasonably low as possible. To help us continue our valuable work, you can support us by making a donation to Blue Orange Arts Ltd, using the button below. Thank you! The Blue Orange Theatre is primarily a fringe-professional producing theatre. We also work with other Midlands-based professional or fringe-professional theatre companies. If you are interested in putting a show on at the theatre, please use the contact form to get in touch, making sure to include as much information as possible about your production. We strongly encourage you to watch at least one of our productions to better understand the quality of the theatre we are trying to create. The Studio and bar are available for hire for corporate functions, rehearsals and courses. We can hire from half-day sessions to entire weeks. Please call for pricing. We are also fully wheelchair accessible. If you have any special requirements, please get in touch and we will do our best to accommodate you.